The series continues in this latest volume by our usual intrepid authors! “The Scotland Yard Murder” by IA Watson is based on a historic event. During the Jack the Ripper killings, a woman’s torso is discovered inside the site of what will become “The New Scotland Yard!” The incident was extremely embarrassing for Scotland Yard during a time when citizens already thought them failures because of Jack the Ripper. 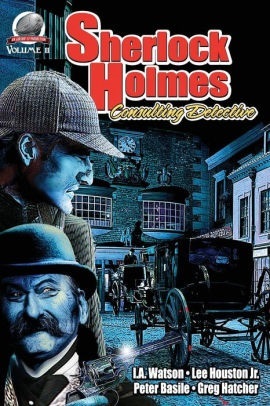 Holmes is requested to investigate. “The Adventure of the Artful Forger” is by Lee Huston, Jr. Holmes is retained by a wealthy man, Lord Van Horton. Someone has stolen his wife’s picture from his private study. The story isn’t all that bad, but I did like it the least in this volume. It just didn’t resonate with me. I cannot put my finger on what I feel is missing. I’m sorry, Lee. Rounding out our stories is “The Adventure of the Conundrum King” by Greg Hatcher. What can I say about a story that is really, really good? Kudos for this character and I am sure you will know what I mean, Greg, when I say a tip of the green derby to you! Great stuff! The volume is a welcome addition to the series. I give it a big four stars!